Reeves, Michael. 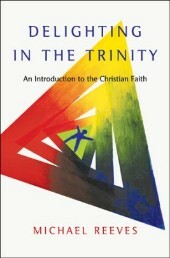 Delighting in the Trinity: An Introduction to the Christian Faith, IVP Academic, 2012. 135 pp. Not all that long ago I had the pleasure of listening to Michael Reeves' lecture series "Enjoying the Trinity." I came away from that series feeling like I had been met with one of the greatest presentations on the subject that I have ever heard. Reeves has the uncanny ability to communicate profound biblical truth using an enjoyable and easy to comprehend style- the mark of a truly great bible teacher. Thereafter I enthusiastically ordered a copy of Reeves book, and upon its arrival I greedily consumed it. This 145 page book positively made my heart sing. Reeves presents to his reader a truly delightful and refreshingly lovely God. And, he does so with a joy that is absolutely infectious. Having read innumerable books on the subject, I have yet to come across one that communicates the Trinitarian faith with such a lucid, and downright pleasurable style. Ironically, what separates Delighting in the Trinity from many of its contemporaries is that Reeves presents the Trinity by means of an intensely biblical portrayal. He doesn't begin with a discourse on epistemology, and he doesn't first appeal to a sophisticated philosophy. Rather he begins by dispelling the popular myth that the Trinity is a "cold and stodgy" "irrelevant dogma," or even a "spooky" mystery. I can only imagine his uninitiated readers shaking their heads in agreement, that is, until Reeves presents them with a God who is unrelentingly Father. Reeves presents the Father, Son, and Holy Spirit in that order, and intersperses each chapter with interesting and relevant vignettes on everything from patristic writers to medieval monks and puritan theologians. Throughout the book, the Trinity is presented in such a way so as to make known its actual theological and practical ramifications. That is, Reeves teaches the reader really good theology and praxis. No surprise here really, as Reeves is a systematician by trade. Delighting in the Trinity is an outstanding contribution in every sense, and it ought to be a key resource for discipleship in every Christian church.